Rotimi Akeredolu also known as “Aketi” is the Governor-Elect of Ondo State, Nigeria and also a Senior Advocate of Nigeria (SAN) who became president of the Nigerian Bar Association in 2008. Akeredolu is also a Managing Partner at the Law Firm of Olujinmi & Akeredolu, a Law Firm he co-founded with Chief Akin Olujinmi, a former Attorney General and Minister for Justice in Nigeria. Akeredolu was born on 21 July 1956 in Owo to Reverend J. Ola Akeredolu of the Akeredolu family and Lady Evangelist Grace B. Akeredolu of Aderoyiju family of Igbotu, Ese Odo, in Ondo State. Akeredolu started his primary education at Government School, Owo. He proceeded to Aquinas College, Akure, Loyola College, Ibadan and Comprehensive High School, Ayetoro, for his secondary school education and Higher School Certificate, respectively. He attended the Loyola College in Ibadan. His middle name “Odunayo” means “Year of happinesss” in Yoruba He went on to the University of Ife (now Obafemi Awolowo University) to study Law, graduating in 1977. He was called to the Nigerian Bar 1978. 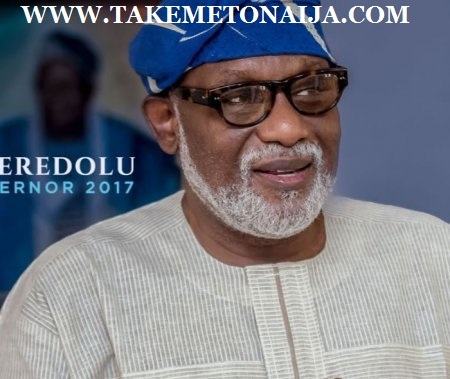 Akeredolu was appointed Attorney General of Ondo State from 1997–1999. In 1998 he became a Senior Advocate of Nigeria. He was Chairman of the Legal Aid Council (2005–2006). In November 2009 he faced allegations of corruption when the Bar Association’s Third Vice-President, Welfare Secretary and Assistant Financial Secretary circulated a petition entitled “Complaints against your fraudulent manifestations, violation of the NBA”. Subsequently, the allegations against him were reviewed and dropped by the National Executive council of the Nigerian Bar Association. In a lecture in December 2009, Akeredolu said no amount of electoral reform or judicial system could give Nigeria free and fair elections, if Nigerians themselves refused to take practical steps to ensure that their votes count. Later that month he stated that Umaru Yar’Adua, the President of Nigeria should have handed over to Vice-President Goodluck Jonathan in an acting capacity during his illness, a statement that was backed up by the Nigerian Bar Association who said he was authorised to speak on their behalf. In November 2011, Akeredolu was among a crowd of aspirants to be Action Congress of Nigeria (ACN) candidate for Governor of Ondo State in the 2013 elections. In an interview that month, Akeredolu said that he had become well known and respected as president of the Bar, and described himself as a progressive. If elected, his priorities would include agricultural development, fish farming for export, improvements to education, jobs for youths and improved roads. He would provide free education and primary health care. He was in favour of increased subsidies and greater local control over public spending. On 28 July 2012, On Akeredolu was selected as the Action Congress of Nigeria (ACN) candidate for Governor of Ondo State during the ACN congress in Akure. His selection pitched him in a head to head battle with the incumbent, Olusegun Mimiko and Mr Olusola Oke of the Peoples Democratic Party (PDP). Akeredolu promised to create 30,000 jobs in his first 100 days in office. His promise was refuted by the Peoples Democratic Party (PDP) as a ruse. His promise nonetheless resulted in the submission of over 10,000 CV’s to his campaign office. On Saturday September 3, 2016, in a controversial primary election that rocked the ruling party during which Asiwaju Bola Tinubu, a major party voice and National Leader of the ruling APC demanded the resignation of the party’s chairman John Odigie-Oyegun, Akeredolu was awarded ticket to represent the All Progressive Congress (APC) the 2016 elections for governor. On Sunday, 27 November 2016, he was declared winner of the keenly contested Ondo State gubernatorial elections. 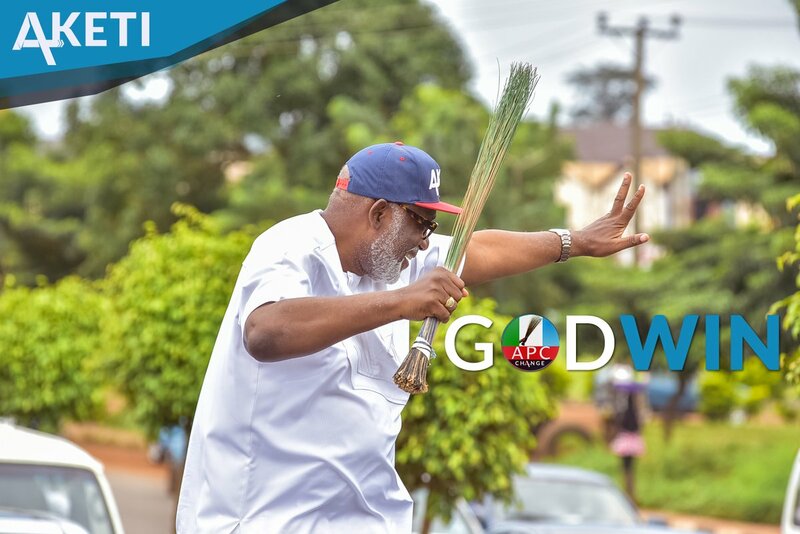 On Sunday, 27 November 2016, Akeredolu was announced by the Independent National Electoral Commission as the winner of the Ondo State Governorship Election. Mr. Akeredolu scored 244, 842 votes in the election while Mr. Oke won 126, 889 votes and Mr. Jegede 150,380 votes. According to Prof. Ganiyu Ambali, INEC Returning Officer, Mr. Akeredolu defeated two major opponents, Eyitayo Jegede of the People’s Democratic Party (PDP) and Olusola Oke of the Alliance for Democracy (AD), to clinch victory. He is to be sworn in as the governor of Ondo State on the 24th of February, 2017 in Akure, the Ondo State Capital. The ingredient that oils the wheel of our marriage is communication. must be one topic we are discussing and we are never on the same side. You are an Igbo woman married to a Yoruba man. How did you manage the culture clashes? in-laws, but he didn’t. And here we are growing old together (laughs).